Things I Don't Understand. Episode 1.
children that don't eat when they are hungry. or how about boys that choose to open the front door to pee rather than using the toilet that is in the bathroom right next to the front door. 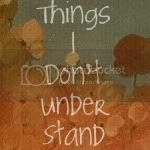 never, never will I understand.